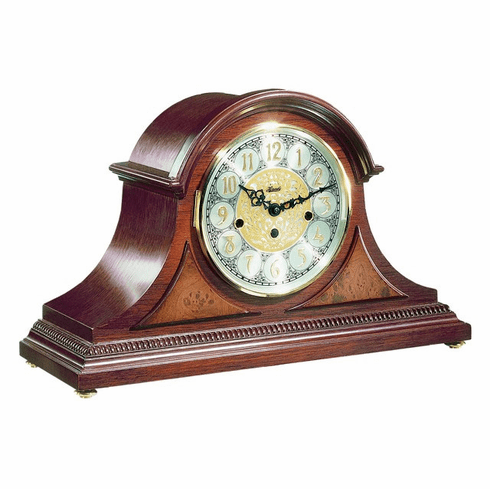 Beautifully styled tambour clock in an elegant cherry finish, with brass feet, raised burl veneer panels and a beaded molding across the bottom. The dial features a diamond turned chapter ring with raised Arabic numerals and a beautifully embossed center. The hands are metal serpentine behind a brass bezel with convex glass lens. A mechanical brass 8-day key-wound that plays 4/4 Westminster chimes. Dimensions: H: 11-3/8", W: 18-1/8", D: 6-1/2"